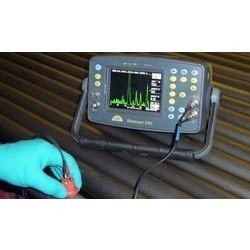 UT is a Non-Destructive method in which beams of high- frequency sound waves that are introduced into the material being inspected are used to detect surface and sub-surface flaw I.
PAUT is an advanced method of ultrasonic testing. Instead of a single transducer and beam, phased array uses multiple ultrasonic elements and electronic time delays to create beams by constructive and destructive interference. Measuring Range: 0.040" to 20"
Services available in South India only. 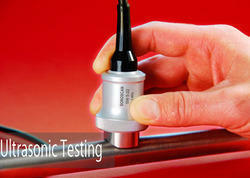 Being an eminent company, we are involved in rendering Ultrasonic Inspection Service. Captivating the skills of our professionals, we are involved in rendering Phased Array Ultrasonic Inspection. With genuine meanings to acquire huge level of client contentment and faith, we are readily immersed towards delivering Ultrasonic Inspection Services. To render these services, we have hired a dexterous team who is having years of expertise in this realm. More to this, our customers can get these from us in multiple provisions at affordable costs.